Stigmatizing someone is not something an individual can do by themselves. It is an emergent property of society, something that arises in a culture when a sufficient number of people are overtaken by ignorance and fear. When this tipping point is reached, the social shorthand of stigma becomes operative and potent. I want to be clear about the people who are involved in this process. The simplistic assessment that they are evil isn’t accurate. They are most often fearful and ignorant. Most of us understand fear, but I think many of us misunderstand the nature of ignorance. I used to think of it as a synonym for dumb or stupid, but that isn’t accurate and it isn’t what I mean here. I believe that ignorance is, at its core, a lack of understanding rooted in a lack of experience. But there is an element of individual responsibility in ignorance as well, because the ignorant person has no interest in expanding their understanding. The root word in ignorant (ignore) indicates this. The ignorant person doesn’t understand, and because of fear, they willfully choose to remain walled off with a limited and incorrect view of the world. Near the end of my time at A&M, I began to take small steps to transform the stigma I encountered. I was asked (I honestly don’t remember how or why) to serve on a special subcommittee of the Faculty Senate tasked to make recommendations about HIV/AIDS for the university. There were members of the faculty, administration, and a couple of students on the committee, including a wonderful immunologist from the medical school named David McMurray. I was doing my doctoral thesis on computational immunology, so I knew quite a bit about the virus and its effects on the immune system, but I also had a deep experiential understanding of life with HIV. However, I hid this part of myself during the early days of the committee’s work. 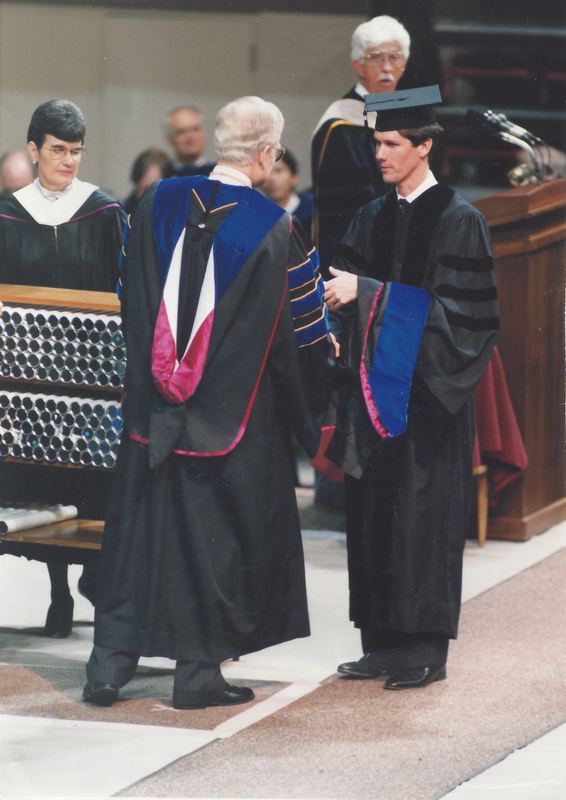 I served on the Texas A&M subcommitte on HIV/AIDS shortly before finishing my PhD. Finally, I decided I needed to come out. I remember the meeting well. I spoke with the committee chair ahead of time, and was given time on the agenda. I shared my news, and members of the committee were both shocked and supportive. After some discussion, someone recommended that we include in the final report of the committee a statement that an anonymous committee member was HIV+. The group came alive, with most people excited at the prospect, realizing it would add extra urgency to our recommendations by demonstrating that HIV was indeed a presence on the campus. But one man objected vociferously. He said forcefully, “I’m a single man in this town. They could think it was me!” Professor McMurray leaned into the table and said emphatically, “Exactly! Or me. Or any of us. It shows that this goes beyond our simple categories of those who get it and the rest of us. We should definitely put it into the report.” I felt profound gratitude and admiration for him, realizing he understood not just the medical challenges facing us, but also the social issues we were up against. The chair stated that we could only include a statement about having an HIV+ committee member if the group universally agreed. If anyone was uncomfortable with the statement, it wouldn’t be included. The single man didn’t budge, and the report was presented without any indication that a positive person was involved. Visit http://clayrides.bike to learn about my cycling to support Housing Works, an amazing organization that provides lifesaving services to homeless people living with HIV/AIDS. A story of HIV, hope, and healing, featuring a loving family, caring friends, and a trusty bicycle.